Aluminum Multi-Piece Steering Bellcrank set (blue), Slash 4x4 Discounts Apply ! 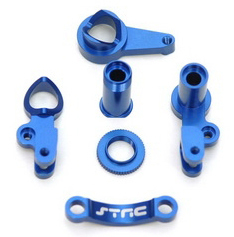 SPTST6845B - Aluminum Multi-Piece Steering Bellcrank set (blue), Slash 4x4. The CNC Machined Aluminum Multi-piece Steering Bellcrank Set greatly increase the durability and take out any flex in the kit plastic bellcrank system providing a more precise steering feel, ST6845B.